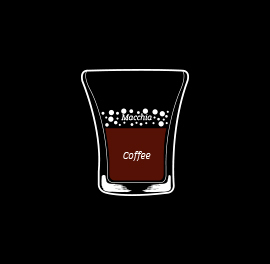 The sound of the coffee when it pour into your cup. The pleasant hustle of the coffee shops. The smell of the infusion of recently served coffee. That taste that brings to you a memory. A cup of coffee can evoke experiences, emotions and situations. Coffee is felt, savored, smelled, seen, heard; and it is this multi-sensorial experience of coffee that captivates its fans. Maxespresso understands this passion, and thanks to its variety of flavors and its special machines, makes possible to enjoy all the coffee experience wherever you go. It pleases all your senses with these coffee versions and you can become an expert coffee lover taken by the hand of Maxespresso. It's just a matter of proportion. 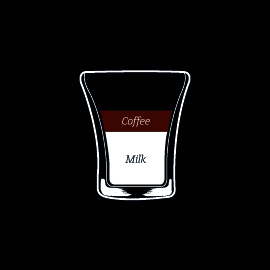 Coffee receives different names depending on the amount of milk with which it is mixed. Use Maxespresso machines to prepare a delicious cup of coffee to your liking every time. It is a coffee that stands alone, main base of all the drinks with coffee. Thee coffee that is made with machine is called Espresso, and it is usually more dense than the coffee made through other methods. It is characterized by its light layer of foam, which is called "cream". Taste an Espresso with the Maxespresso Classico and Intenso. The same amount of grinded coffee that is sued to prepare an Espresso but with half of the water. In this way it is a more dense, intense and aromatic flavor. 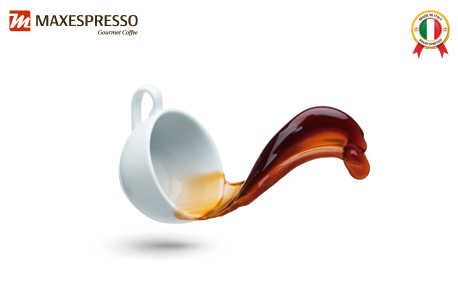 Taste a ristretto with the flavors of Maxespresso Classico, Intenso or Forte. Means "stained coffee". It has to do with an Espresso coffee that is "stained" with a little bit of milk. 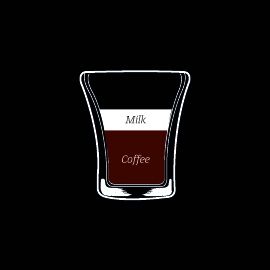 The result is an intense coffee with very little milk. The macchia is a small stain in the foam that stays on top of the milk ti clearly indicate that it has to do with a Caffè Macchiato and not a Coffee with Milk. It is important to not confuse it with a Latte Macchiato. Contains the same amount of coffee and milk. Make a perfect coffee with milk with the Maxespresso Classico flavors, Intenso or Soft. 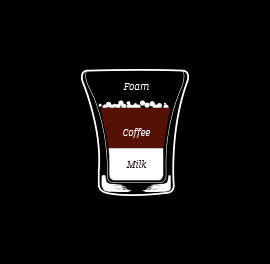 Coffee with lots of milk and lots of foam. Coffee with milk and cream in equal parts. Means "smeared milk". Latte Macchiato, unlike Caffè Macchiato, is achieved by adding a little espresso to a glass of milk and finishing with plenty of foam. 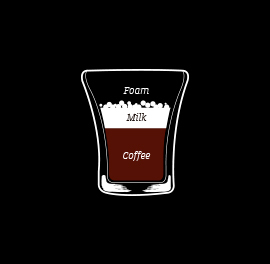 Coffee, a little milk and lots of rich foam. You can top it with a little cocoa powder on top to make it extra delicious. 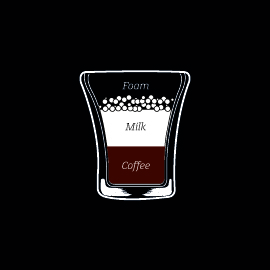 A glass of milk with a small touch of coffee. 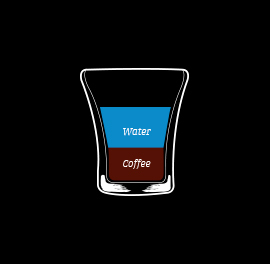 Coffee reduced with the same amount of water. A double serving of Espresso coffee. Espresso coffee with the same amount of whipped cream on top. Coffee, milk and foam in equal parts with a touch of liquid caramel. 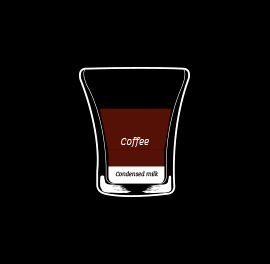 Café Espresso sweetened with condensed milk. Coffee with chocolate, milk and foam. ¿Are you a chocolate lover? In addition, pour syrup and chocolate chips on top. Espresso, milk, honey and cinnamon. 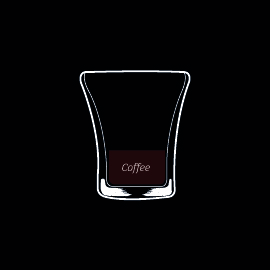 A touch of liquor could make your Espresso coffee in an exquisite drink both cold as well as hot. Coffee, amaretto, whipped cream and a touch of grinded cinnamon on top. Coffee with whisky and whipped cream. 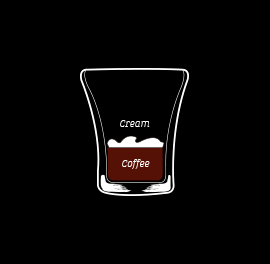 Coffee with vodka and whipped cream. 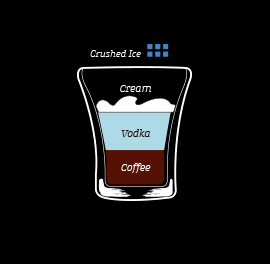 It is served with crushed ice. 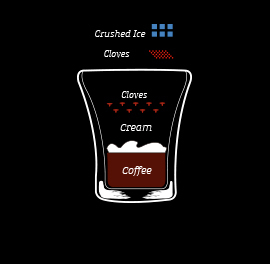 To a glass of crushed ice, coffee and cream is poured in equal parts, and is aromatized with a touch of cinnamon and cloves. 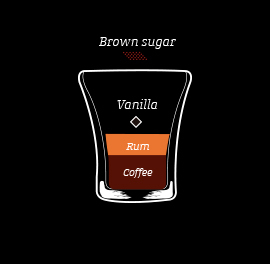 Coffee with rum, brown sugar and vanilla.